An interview with Dirk Wagner, professor of Strategic Management, about the study program International Business here at Karlshochschule International University. Can you describe the International Business study program in three hashtags? Now the longer version. What is International Business all about? The name does of course reflect the program: this is about International Business. We start by making you familiar with the global economy and with the principles of management. Together with you (studying at Karls is a lot about co-creation) we then dive into the world of companies and organizations where you will learn about strategy, marketing, finance & accounting, operations, HR and other value chain activities. 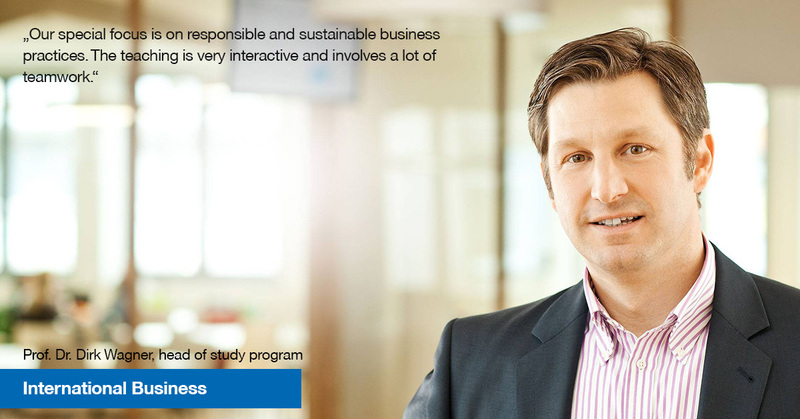 Our special focus is on responsible and sustainable business practices. The teaching is very interactive and involves a lot of teamwork. What is so special about studying International Business at Karlshochschule? There are probably many aspects which make it special. I like that Karlshochschule as a whole creates a great learning atmosphere. You will get to know very competent people from all around the world, and some of them are your fellow students. You will always strike a balance between theory and practice, continuously learn to learn about business, economics, life and you will learn to manage yourself as well as others. What is the most interesting module in your point of view? My point of view is totally irrelevant here. But if you are interested in International Business, it is really important that you take a good look at our study program, talk to people at Karlshochschule about different modules and try to imagine what it will be like to study here. If you identify more than one potential favorite module, you may really have found what you were looking for. How about my job opportunities after my graduation? Our study program International Business qualifies you for many career paths ranging from specialist roles for example in marketing, finance or operations to general management tasks in a variety of organizations. Depending on their strengths and interests, graduates in International Business may start with multinational corporations, medium sized market leaders or even with start-up companies. Many students from Karlshochschule also move on to obtain a Master degree. With a good Bachelor degree in International Business in their pocket they have an interesting variety of Master programs around the world to pick from. Who should apply for the program? What kind of background do applicants need? First of all, you need to have completed your “Abitur” or an equivalent international entrance qualification for higher education. Your grades matter and we will particularly watch out for your achievements in Math and in English. However, equally important is that you want to make a difference. You want to achieve something together with others. So far, you may have demonstrated this in sports, music or with voluntary services to name only a few possibilities. Last but not least, some initial international experience is very common around our freshmen.